Nestled in the heart of Northeast Nebraska, Norfolk (Population: 24,210) and the surrounding communities offer everything you would expect: first class recreation, community festivals, award-winning attractions, unique shopping, and inviting accommodations. We invite you to put our hospitality to the test and discover for yourself what Madison County, Nebraska, has to offer. Norfolk is located in northeast Nebraska in the Elkhorn River Valley of Madison County. U.S. Highways 81 and 275 and Nebraska Highways 24 and 35 intersect in Norfolk. Norfolk is 112 miles northwest of Omaha, 121 miles north of Lincoln, and 75 miles southwest of Sioux City, Iowa. Norfolk Junction, located south of downtown, was the site of the first railroad depot and had its own small town with shops and hotels. To find information on where to stay, things to do (besides the festival of course! 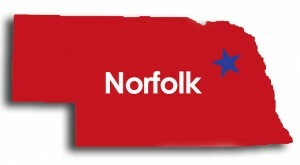 ), and to plan your visit, please visit the Norfolk Area Visitors Bureau website.